Heal and harmonise the body, mind and spirit with Reiki. | Tundeworld! Heal and harmonise the body, mind and spirit with Reiki. How does Reiki help your body to prevent or cure contagious diseases?How Reiki works? When disease-causing microorganisms attack certain parts of the body, reserve energy is channeled to meet these attacks. But if the meridians are blocked, then the flow of reserve energy is hindered and illness results. When using Reiki you cleanse the meridians, harmonizing energy levels and promoting a smooth flow of reserve energy to the areas under attack, thus restoring the balance. Reiki increases our energy reserves, preventing any possible future outbreak of illness. Reiki will improve the results of all medical treatment, acting to reduce negative side effects, shorten healing time, reduce or eliminate pain, reduce stress, and help create optimism Reiki produces a natural free flow of energy. It clears the blockages within us, both for the healer and for our patients. It can therefore help to release pent up emotional or mental stress, deepen our spiritual connection and help our body to be energised and heal itself. The idea of experiencing a Reiki session to balance their chakras seems to just feel ... Whether awake or napping, Reiki works for the patient's highest good. 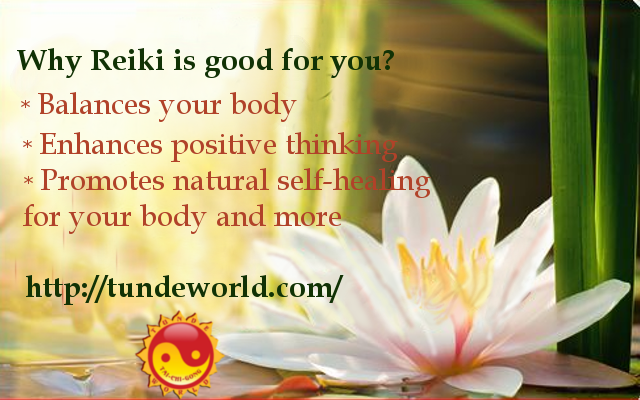 Why Reiki is good for you? Reiki treatment creates several benefits that include relaxation, feeling of peace, security well-being. Reiki healing session includes extremely comfortable state of being that can bring alteration in one's consciousness. It will help you to create a balance between Mind, Body Spirit. Booking your Reiki Treatment. Reiki healing works by the ki from a Reiki practitioner or master (administered by laying his hands) flowing through your own affected ki parts charging them with positive ki which raises the vibrational level of the ki in and around your body that has the negative thoughts or feelings. The vibration caused breaks apart the negative ki in your body and so your ki pathways becomes clear and straightened, thereby allowing your ki to flow in a healthy and natural way. Reiki is a simple and natural way of getting healed, and improving your self, you can be a part of Reiki healing. It is administered by a Reiki master or you do it yourself as it has simple and clear steps to follow to be healed. Amazingly, Reiki doesn't just give you physical healing, it also treats the whole you (spirit, mind and emotions). Reiki pronounced as ray-key is from two Japanese words Rei (which means God's wisdom or the higher power) and ki (which means life force energy). The word Reiki means “Universal Life Force Energy”. You can say Reiki is a spiritual or God life force or energy. In actual sense Reiki is a form of spiritual healing that uses ki (life force or energy) that flow through your body and causes you to be alive. The level of ki in you determines your mood and health state, when your ki is low, you feel stress are you're more likely to get ill, while when your ki is high, then you feel happy and healthy. Reiki is a simple, natural and safe method of spiritual healing. Reiki energy is transferred by the gentle placing of hands on your own body, that of another person and, or their energy field. Heal and harmonise the ;body, mind and spirit with Reiki. Reiki speeds up the healing process and supports the body’s natural ability to heal itself. Reiki can help cleanse toxins from the body and boosts the immune system. Reiki balances the energy centers of the body (the chakra) and vitalizes the body and mind reducing stress and anxiety. It helps to alleviate chronic pain and helps to heal emotional issues and calm an overactive mind. It has been effective in helping virtually every known illness and always creates a beneficial effect. Reiki works in conjunction with all other medical or therapeutic techniques to relieve side effects and promote recovery. Historically, Reiki originates from Tibet, and was rediscovered by Dr. Mikao Usui, who was a Japanese Buddhist in early 20th century and since then Reiki has been used and has had miraculous results in people's body. Reiki, is an ancient hands-on Japanese healing technique that can benefit our wellbeing by supporting the body, mind and spirit. Reiki is not a religion, so you don't have to be in any religion to practice Reiki healing. Usui Reiki healing techniques requires learning from a teacher who is directly in the Reiki lineage from masters taught by Dr. Usui or his student, Hawaiian Reiki master Hawayo Takata. Using the information from the energy fields surrounding the body, Heather is able to act as a conduit or channel of the Reiki to help promote healing on all levels of physical, mental, emotional and spiritual. When you experience Reiki healing an amazing feeling of peace and energy will flow through your body. A treatment feels like a wonderful glowing radiance that flows through and around you. During a Reiki treatment, the patient usually lies fully clothed on a padded table in a warm, comfortable room. A thorough session lasts between 60 to 90 minutes. For stress reduction one to two sessions are satisfactory, however for chronic conditions long-term treatment may be recommended. Due to its gentle nature, many people fall asleep during this soothing experience of healing. Reiki treats the whole person including body, emotions, mind and spirit creating many beneficial effects that include relaxation and feeling of peace, security and well-being. Many have reported miraculous results. Reiki is a healing touch (and non-touch) technique for stress reduction and relaxation that supports the body’s natural healing functions. The Reiki system of healing touch isn’t a replacement for traditional medical treatment but can be used in conjunction with standard medical treatment for any chronic or acute illness. Reiki is a form of energy healing that can be used for yourself or others. It helps you to increase the level of “chi” (energy) in your body and in your environment. The client who can be sat on a chair or laying down on a couch whatever is comfortable. Reiki can sent from a distance with no need for the client or Reiki practitioner to be in the same room together. Before the treatment begins, it is usually requested that the client removes their shoes, watch and any excessive jewellery not only to promote comfort and relaxation but also so that they do not disrupt the flow of energy during a treatment. When you would like to bring balance to your life, contact Tunde for more information and booking at Tundeworld. Tunde is a healing specialist has developed a broad choice of treatment options that bring optimal outcomes for patients with a wide variety of needs and various health concerns. Reiki Course are available for learn about more Reiki. Dates to check click on level Reiki Level1 and level2 .